The trendy sport of Snow Volleyball is now growing across Turkey. 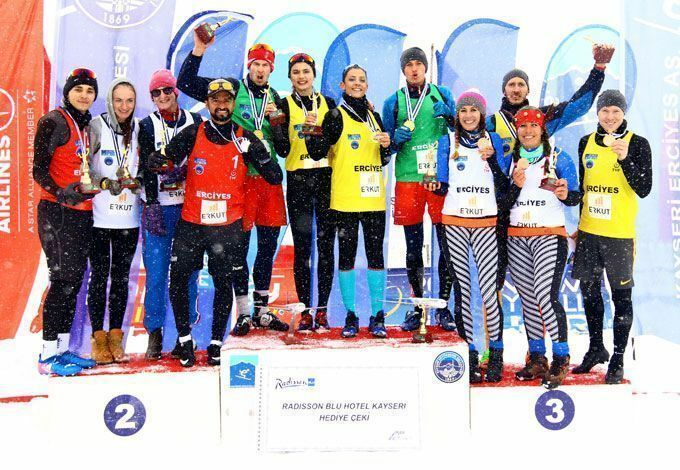 The opening event of the 2018 CEV Snow Volleyball European Tour took place 12-14 January 2018 at the Mount Erciyes, Turkey for the third time. Mount Erciyes, which is one of the highest peaks in Turkey, has new ski resorts that are now becoming more and more popular all around Turkey and in Europe as well. By putting winter sports and winter tourism at the top of their agenda, Erciyes A.S aims to raise the profile of the city of Kayseri by hosting national and international sports events, such as World Championships and maybe the Olympic Games in the long term. The organisers want to make Mt. Erciyes a centre for winter sports, a place known all over the world. The country’s fifth-highest peak at 3,917 m – where a Snow Volleyball event of this calibre is taking place for the second straight year. The first stop of the 2018 CEV Snow Volleyball European Tour was one of the major highlights on the programme throughout this winter season. The tournament featured a DJ right by the centre court to contribute to a perfect atmosphere. The event had some extra fun times and shows along with Snow Volleyball activities. The players and visitors had the opportunity to taste the delicious Turkish cuisine, with dishes including sucuk, pastirma, yaglama, yag mantisi, and katmer. The women's team from Turkey and the men from Russia were the ones adapting to the weather the best. A total of three medals for Russia, two for Turkey and one for the Czech Republic were presented in this much anticipated season opener. The next event in Turkey will be held in Uludag, Bursa from 1 to 4 March 2018. A total of 76 players from 11 countries (Belgium, Czech Republic, Switzerland, Italy, Lithuania, Poland, Romania, Russia, Serbia, Slovakia, Turkey) participated the event. The winning teams in both men's and women's category received 1000 euro prize. The list of countries hosting a national Snow Volleyball championship includes nations known for their prowess in winter sports – such as Austria, Czech Republic, Germany, Latvia, Norway, Slovakia, Slovenia, Switzerland or Ukraine – but also countries as varied as Armenia, Croatia, Georgia, Greece, Hungary, Lithuania and Turkey.